Long-Running Kars4Kids Radio Jingle Debuts On TV! The jingle that people love to hate now becomes even more inescapable. The Kars4Kids radio jingle has been running for decades, virtually unchanged, on dozens of stations nationwide, reaching an estimated 50 million listeners daily. Well, here’s some big news about that jingle: it’s now running as a commercial on TV! Just debuted this week in the New York area and aired on all major networks including Fox News, ESPN, NBC Sports, CBS Sports and CNBC. This is a trial run as the organization considers airing it nationwide. 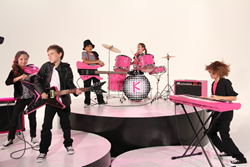 The jingle was specially spruced up with a few more instruments than the original version and some real kuties jamming away in Kars4Kids' brand color Hot Pink. The 30 second spot really does a good job of drilling those telephone numbers in. The buzz has already started on social media as those infected with its jingle through its radio ads can not believe their eyes.